JBL Bar Studio is rated 4.2 out of 5 by 33. Rated 5 out of 5 by Bema from ❤️❤️❤️ Awesome product! Great sound quality! We bought a blue tooth speaker as well and both deliver! Rated 5 out of 5 by CJ606 from Easy set up; exceptional sound. When buying audio or video equipment, there is always a concern over how things get set up and work together. With the JBL Studio 2.1 sound bar, that wasn't a problem. Setup was a breeze, and worked flawlessly with my Samsung TV. Even the remote was paired for Samsung and other top brands out of the box. Sound is clear, rich and with the subwoofer, I'm hearing the full audio range of programs and movies. I highly recommend the JBL Studio. Rated 5 out of 5 by Trainman from Perfect addition to Samsung TV My wife and I are both getting hard to hear and the TV must be set to loud volume for us to hear. Your sound bar is the perfect answer, sound is nor tiny when on louder volume. Now we are both happy! I want to buy JBL Bar Studio but I'm india how can i get this. We would like to work with you directly. Please submit a case request at https://www.jbl.com/contact-support.html and our Customer Service Team would be more than happy to assist you. I can&rsquo;t get my bar studio to work with my Samsung tv. What can I do? We would like to work with you directly to get more information and help you with your issue. Please submit a case request at https://www.jbl.com/support-contact.html and the Customer Service Team will be more than happy to assist you. Looks like I'm having the same problem as another poster. When there is very little background noise in the program I'm watching, the bar falls completely silent and kicks back in when the program noise increases, albeit with a tiny delay. I have the same problem. Is there a work around available? The woofer size inside the soundbar is 2&quot;. I've hooked up the JBL Bar Studio using HDMI to my SkyHD box, when watching certain TV shows the Bar Studio has an annoying compressor / ducking feature. Is there anyway to turn this off? I've verified that it's not on the original recordings. Can you pair an already existing jbl sub with this? I purchased a sub and soundbar together and the soundbar just stopped working and jbl doesn&rsquo;t want to do anything about it. So now I have this amazing sub collecting dust. Unfortunately the JBL Bar Studio can't be paired with another subwoofer since it's a stand alone soundbar with a Bass volume control. Yes, it should work from 100v - 230v. Can you pair this soundbar with an older model JBL subwoofer (SB300)? My exisiting soundbar that came with the SB300 died and cannot find the exact replacement. 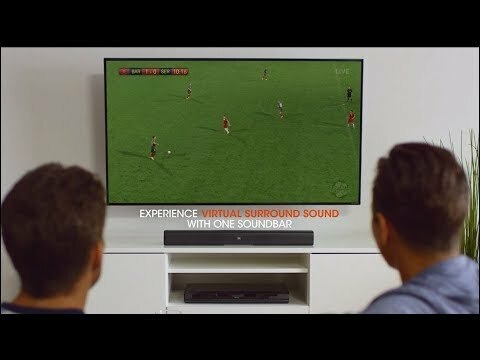 The JBL Bar studio is a stand alone Soundbar and cannot pair to a subwoofer.